ISCA - International Sport and Culture AssociationISCA calls for applicants: Become a European volunteer at ISCA in 2017-2018! ISCA calls for applicants: Become a European volunteer at ISCA in 2017-2018! If you wish to live abroad, work in an international environment and gain experience in the field of international youth, sport and culture then this is your opportunity! We are searching for self-motivated, enthusiastic and energetic young people who will join our team in Copenhagen. Experience something new, broaden your horizons and develop your skills. 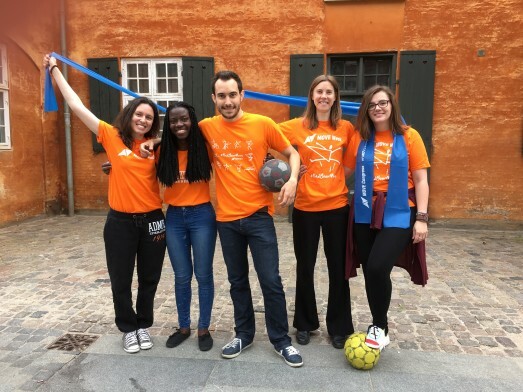 Apply now and become an EVS volunteer at the International Sport and Culture Association (ISCA) in Denmark. You can read more about ISCA here: www.isca-web.org. ISCA is looking for 3 volunteers to join the team in the office for a period of 12 months starting from 1 March 2017. The deadline for submitting your application is 18 November 2016. Confirmation to selected volunteers will be sent no later than 9 December 2016. As indicated in the Erasmus+ programme guide, volunteers should be between 17 and 30 years old, and resident in the country of their sending organisation (from Programme countries and Partner countries neighbouring the EU, see programme guide for more details). ISCA - for this call - will give priority to recruiting volunteers who have a sending organisation in the following countries: Slovenia, Czech Republic, Estonia, Malta, France, United Kingdom, Portugal, Greece and Germany. All volunteers will have the opportunity to be engaged in a number of projects, campaigns and events. ISCA is coordinating various activities in the promotion of sport and physical activity on regional and international level. ISCA also engages many member organisations and other partners in diverse projects of key issues and topics. Additionally, you will be part of the ISCA team organising events and activities in externally funded projects in cooperation with member organisations and other partners. Some of the projects fall within topics with current priority, such as physical activity and health, physical activity and education, health-enhancing physical activity, sport and physical activity for disadvantaged groups, physical activity in urban facilities, inclusion of refugees through sport, youth training and active ageing. The applicants should be highly motivated, proactive and dynamic young people. For this round, interests in the area of financial and adminsitrative management will be a plus. If you are interested in this opportunity, please send your CV and letter of interest (indicating your motivation and key competences) latest 18 November 2016, 24.00 CET to Laura-Maria Tiidla at lmt@isca-web.org. Add at the subject line of your e-mail "EVS 2017-2018". Please note that only application referring to this call will be considered. We will inform all candidates about the outcome of the first phase of the selection process no later than 25 November 2016 and let them know if they are invited for an interview. In case you have any further questions please do not hesitate to contact Laura-Maria Tiidla at lmt@isca-web.org, or by phone: 0045 21588463. For general information on EVS click here and find out more about EVSs at ISCA on our website.